As you’ve probably noticed by now, updates have become very… sporadic over here at Gaming Reinvented. But that’s not just because of us spending a lot of time playing the games that we’re supposed to be writing about! Oh no, it’s because over here on Gaming Reinvented, we’re in the middle of a major site redesign. Well to put it simply, we’re moving the site away from a single author/team project to more of a community setup. In other words, you’ll be able to write your own articles, reviews and guides and host them on Gaming Reinvented, sort of like a cross between a traditional gaming site and a platform like Reddit or Medium. 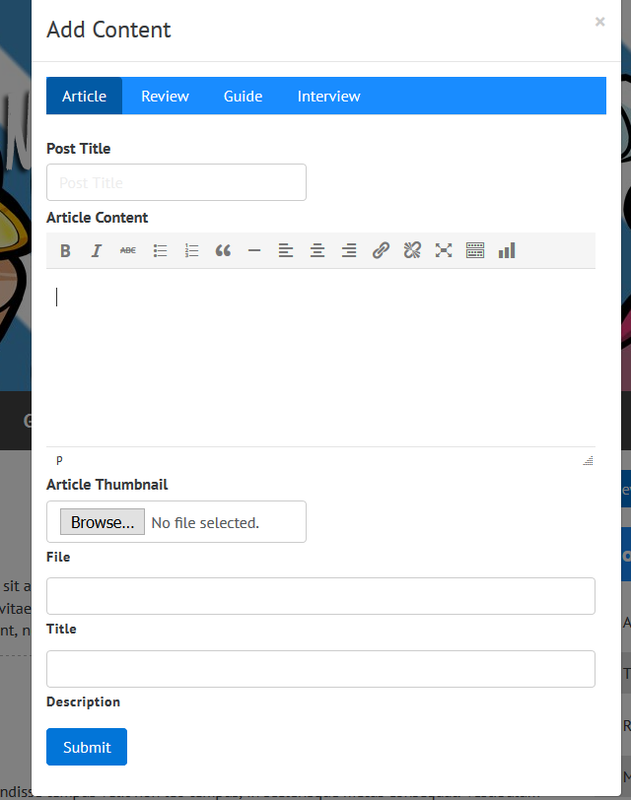 We’ve already implemented the first part of this, with a button that opens up an editor for posts/reviews/guides/interviews for logged in users. Choose things like whether the liveblog functionality is active or not, for quick updates. In addition to this, another interesting feature in the works lets you control how your article is monetised. You see, a while back, we talked about the possibility of having paid subscriptions on Gaming Reinvented. Well, that’s still a thing that’s in the pipeline, but for the most part, it will be up to the writers whether they charge for content or not. Think your craft can’t survive with ads as the sole monetisation method? Then paywall your article, which will require a specialised Gaming Reinvented membership to view (you can set a short preview for people who aren’t logged in). Think it’s better to keep things private? Then you can simply make your article or review member only, to restrict it from search engines and non users on this site. Or you can simply forget all that, and just make the article free without any advertising. It’s all up to you. There are also a few interesting systems to encourage more ethical journalism on the site. On other gaming sites, the writers tend to agree to embargoes and deals in secret, with at best a tiny tagline at the end stating that the review copy was provided by the publisher. Other features, which are still in development include the ability to add fan game/indie projects and save them to the site, with a mini website type deal for the project, a way to upload and share videos as part of a gaming specific video hosting site and the possibility of letting members create quizzes, complete with multiple choice questions and a complex scoring system. But these are future concepts, and we’ll be focusing more on the ability for members to post articles in the short term. So what do you think? Are you interested in our new design and plans for Gaming Reinvented? Would you be interested in a gaming site which lets the actual gamers post the news rather than a small team or single person? And what other types of content do you want to be able to create on Gaming Reinvented? Awesome ideas. I think commenters should be able to evaluate the articles as a ways to naturally keep the quality since anyone can participate. I really like the sound of being able to control who seeis it and if you can potentially gain revenue from it. It sounds pretty good. I also like we can draft our articles so we don't have to finish them in one go or lose the format in order to save said drafts locally in our computers. So yeah, more updates made. Likes seem to be working, Reddit sharing implemented, getting back to posting articles.